View the pictures they are ALL OF THE PACK FOR SALE HERE!! Glenn did it again with a great find! Unfortunately he could only buy ONE pack FILLED withg gear - and we think it will sell rather fast, and as usual, once it is gone, it is gone for good. The front side is molle webbing to attach up to 4 mag pouches and 2 Ifaks or canteens. 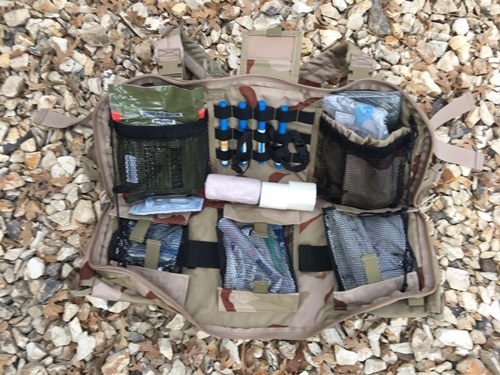 Attached are (4) m4 double mag pouches and (2) Medical Pouches! These are removable and 3 rows of Molle webbing go across the entire front so you can configure additional packs/pouches according to mission directive. There are two shoulder straps that crisscross each other for comfortable carrying as a chest bag. There is also a waist strap to keep the bag stable while in use or when it is carried. There are straps to secure long items on the underside of the bag. (4) Petrolatum Gauze 3" x 18"
(29) Steri-Strip packets 1/8" x 3"